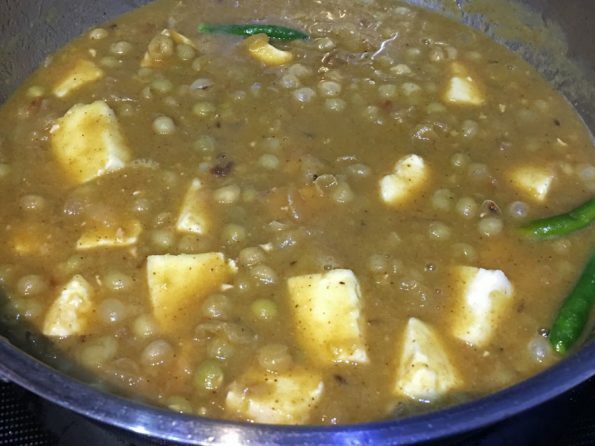 Matar paneer recipe without tomato or green peas paneer curry recipe without tomatoes is so easy to prepare and it makes a yummy curry for rice, chapathi or poori. 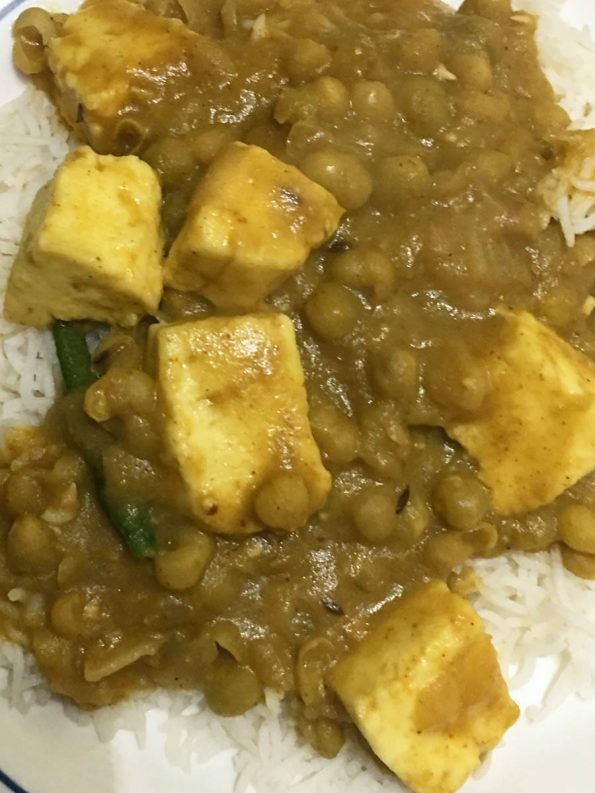 In the below picture, you can see matar paneer curry served with rice which makes a simple and delicious lunch or dinner. This is an easy, simple Indian style matar paneer curry recipe without tomato or easy paneer peas curry you can make at home even if you don’t have any tomatoes at home. 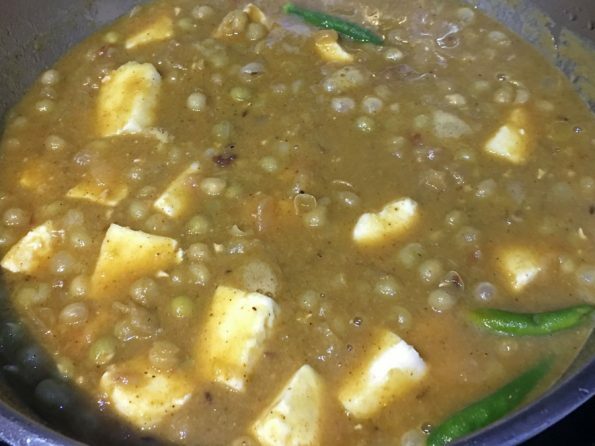 This is an easy matar paneer curry you can prepare at home using dry green peas, fresh peas or frozen pea. I used dry green peas so I had to soak it in water for about 6 hours, if you are using dry green peas soak if for at least 5 to 6 hours or soak it overnight. If you are using fresh peas or frozen peas you can skip this step of soaking in water and adjust the cooking time, as the cooking time in pressure cooker mentioned here is for dry green peas. If you are using fresh or frozen peas you may also cook the peas directly in a pan instead of using the pressure cooker. If you like green peas recipes, also try this easy peas potato curry for chapathi and easy green peas masala for chapathi. 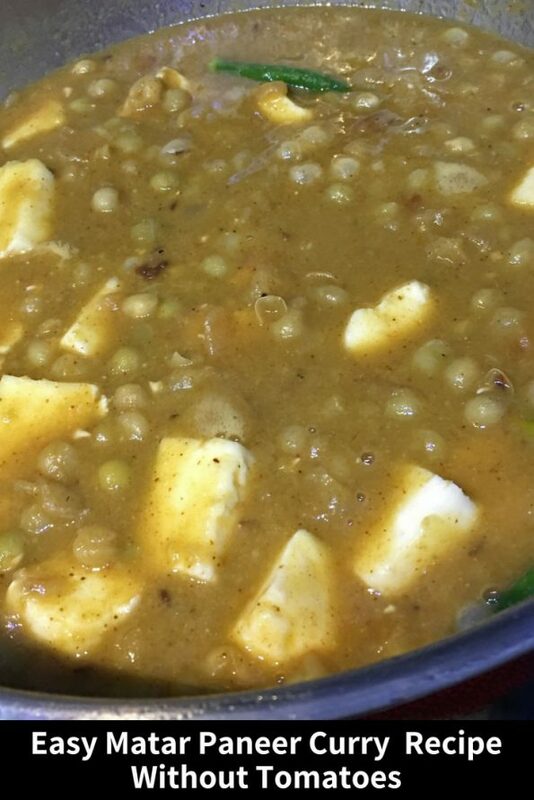 So here is how you can make this easy and yummy matar paneer curry or peas paneer curry following this easy peas paneer curry recipe without tomato. 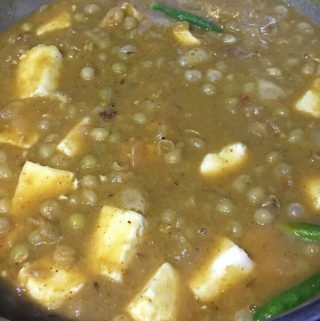 Easy and simple matar paneer curry or green peas paneer curry prepared without tomatoes, so you can use this recipe to make easy and delicious matar paneer curry even when you don't have tomatoes at home. Soak the dry green peas for about 6 to 7 hours at least in enough water, after soaking drain the water and rinse the peas in water again, keep the washed peas aside. If you are using fresh or frozen peas, you can skip this step. Cut the paneer into medium sized cubes, keep aside separately from the peas. If you have frozen paneer, you can defrost it in microwave or just microwave the paneer in any microwave safe plate for about 1 to 2 minutes which will help you to cut the paneer very easily. Make sure to cut the paneer very gently so it won't crumble. In a pressure cooker, add the washed green peas, 4 cups of water, sugar and enough salt, close the pressure cooker with lid and safety valve and cook for 4 whistles or about 12 minutes in medium heat. This is if you are using dried peas and we want the peas to be cooked really well and soft as we are not using any tomatoes, and we want the peas to be cooked really well to thicken the gravy. If you are using fresh or frozen peas, you may need to reduce the cooking time accordingly or you can cook it separately in a saucepan. Just make sure to cook the peas very soft, as some of the peas will get mashed up with the gravy which makes the gravy thick and delicious. Wait until the cooker is cooled enough before opening. Meanwhile heat 2 tablespoons of oil in a pan or skillet and add the chopped onions. Add salt and saute the onions in medium heat until the onions are almost caramelized or browned really well, which will take around 15 to 20 minutes. Make sure to stir the onions in between, especially after start turning brown so as to avoid the onions getting burnt at the bottom of the pan. Once the onions are caramelized or browned, keep this aside. Once the pressure cooker is cooled enough, open the cooker and see if the peas is cooked really well. You might think the peas is a bit overcooked, but try it that way as it will make the gravy more delicious. Stir the cooked peas really well. In a medium or large sized pan, heat the remaining one tablespoon of oil and add the cumin seeds. When the cumin seeds are lightly browned, add the ginger garlic paste and green chilies, stir fry in low heat for about a minute. Add the cooked peas mixture to the pan and stir the contents well. Add the caramelized onions also to the pan containing the peas and mix everything well. You can check if there is enough salt, and if you need more salt, you may add a little more based on your preference. Add the spices - turmeric powder, red chili powder, coriander powder and garam masala powder, mix everything well and bring the mixture to a boil. Once the mixture starts boiling, add the paneer cubes to the mixture, gently stir the contents, cover and cook for about 5 to 6 minutes or until the paneer is soft. Make sure not to overcook as the peas is already cooked and we don't want the paneer cubes to break down and become crumbly. So just cook a few minutes until the paneer is cooked and tender. Gently stir in between using a good quality steel spatula which will help with mixing gently without breaking the paneer. Once the paneer is also cooked, gently mix in the contents again and the matar paneer curry is ready to be served! Enjoy the delicious matar paneer or peas paneer curry with rice, chapathi or poori as you wish. 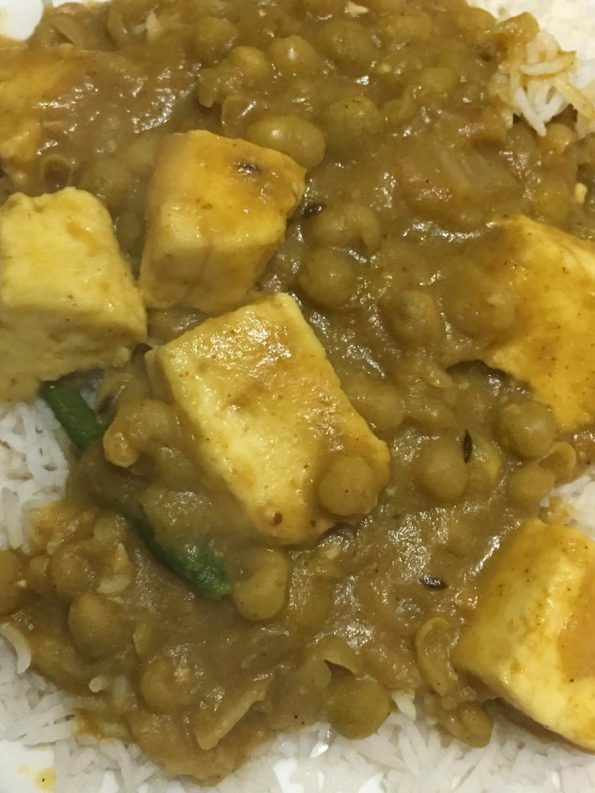 Hope you found this post on matar paneer recipe without tomato or peas paneer curry without tomatoes helpful in making easy and delicious matar paneer or green peas paneer gravy even when you don’t have tomatoes at home.